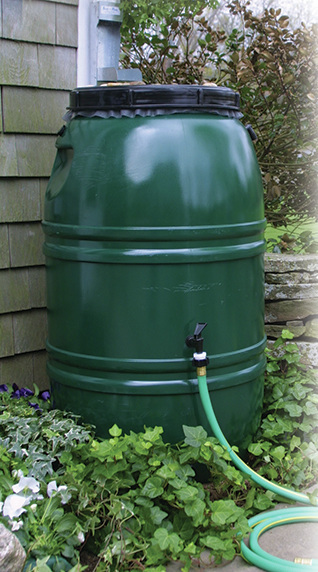 Rain barrels are most commonly used in a residential setting to capture rain from rooftops that would otherwise be directed to a storm drain. Using a rain barrel or a series of rain barrels will help reduce runoff volume, promote infiltration, and slow and filter runoff from the roof. They also help reduce runoff and erosion during large storm events, and maintain plants and gardens during extreme hot and dry conditions or in a drought. Rooftop runoff collected can be stored and used later for non-potable applications such as watering a lawn or flower garden. Rain barrels take up very little space, are inexpensive, and easy to install. There are many styles of rain barrels that can be found online or at your local home goods or landscaping store. Rain barrels require regular draining after rainstorms and removal of leaves and debris collected on screens. Always check that the overflow is clear and directed to an appropriate location. Rain barrels range from $20 for a do-it-yourself kit to upwards of $200. A rain garden is a specialized landscape design that captures runoff from roofs, driveways, or other impervious surfaces. It uses plants to remove pollutants and improve infiltration, allowing water to soak back into the ground. 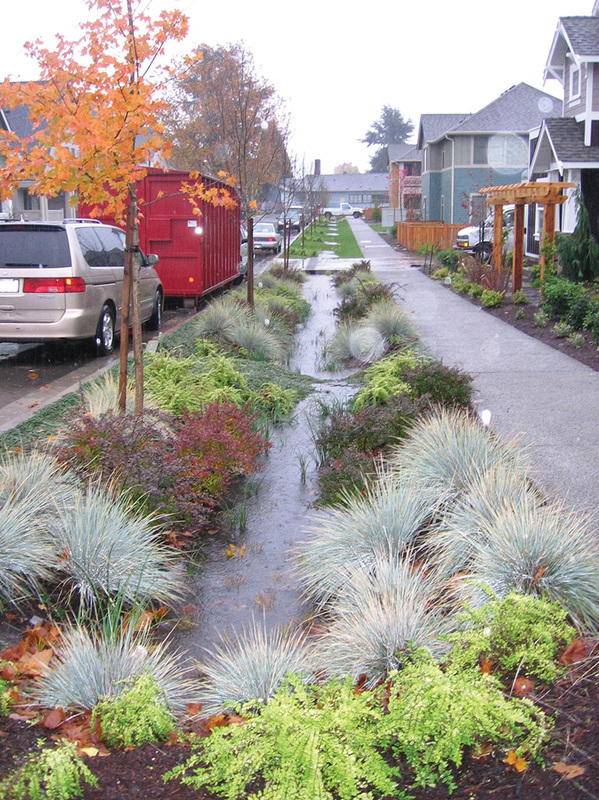 Rain gardens increase aesthetic value, absorb water, reduce runoff, protect water quality, and prevent flooding. The average cost of a rain garden is about $8-$10 per square foot depending on several factors including area, site preparation, plants (types, sizes, and quantity), and any additional accents or features. Similarly, bioretention cells are shallow, landscaped depressions that can handle large volumes of water. They are well-suited for commercial, institutional, industrial, or residential settings. Maintenance of your rain garden is critical during the first couple years after installation. The plants will need to receive plenty of water until they are well established. Mulching, weeding, and replacing plants that fail to thrive in the rain garden are all important maintenance tasks necessary for both the maximum success of the rain garden and to control invasive species that might infest the garden from nearby sources. The use of native, site-appropriate vegetation reduces the need for fertilizers, pesticides, excessive water, and overall maintenance. Approximately $8-$10 per square foot depending on several factors including area, site preparation, plants, and accent features. Once established, native plants need less care than their nonnative counterparts. ​is often lower than the cost of using nonnative plants when factored over a period of time. Native plants are plants that naturally occur in a particular region or ecosystem and co-exist with local fauna, birds, insects, and other animals. These plants have adapted over thousands of years to the diverse weather conditions, soils, and topography of the area and often thrive with less human intervention like watering, fertilizing, and mulching. They provide a key component to a balanced ecological system. Native shrubs, ground cover, and tree roots provide a fibrous web that stabilizes and anchors the soil. The roots function much like reinforcing steel in concrete structures, adding strength. Native plants are beneficial for maintaining shorelines because they decrease erosion from waves and ice while anchoring shoreline soils. They also provide a natural habitat for bees, butterflies, birds, and other wildlife. One of the most important benefits is that native plants help catch and slow rainfall, allowing moisture to evaporate from the leaf surfaces rather than run across the ground picking up contaminants before it enters our lakes and streams. It is best to use native plants with a variety of hydrologic regimes. This way, during wetter periods there are native plants that will thrive, as well as native plants that will endure during drier periods This adaptation technique also helps reduce the likelihood of invasive species taking over and ensures consistent healthy plants and aesthetic value. Native plants also require less fertilizer and pesticides, thus protecting our waters from runoff of these chemicals. This improves the quality of the water in our lakes, streams, and wetlands, as well as the aquatic life in them. ​of native trees, shrubs, and herbaceous plants. Reduction in runoff by increasing stormwater infiltration into soil. Reduced runoff means less nutrients and other pollutants are entering the water body. Stabilization of soils with plant roots. Improvement of wildlife and fish habitat by providing food, shelter, and cooling water temperatures. It is important to note that turf grass does not provide the same benefits that a mix of native vegetation does, and therefore, is not considered an adequate greenbelt. 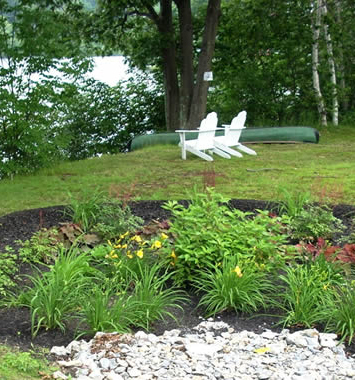 Riparian buffers using native plants often require little to no maintenance once established, leaving more time to enjoy lakefront living. At most, maintenance is common landscaping procedures such as mowing and trimming. Greenbelts are relatively inexpensive to plant. 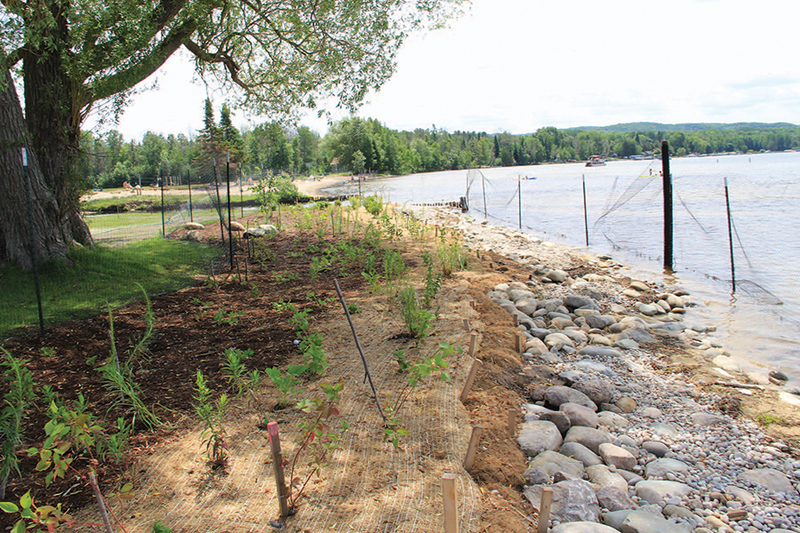 Many federal, state, and local governments, and even community organizations such as lake associations offer financial incentives to install riparian buffers. Restoration project at Camp Pet-O-Se-Ga in Petoskey, MI. 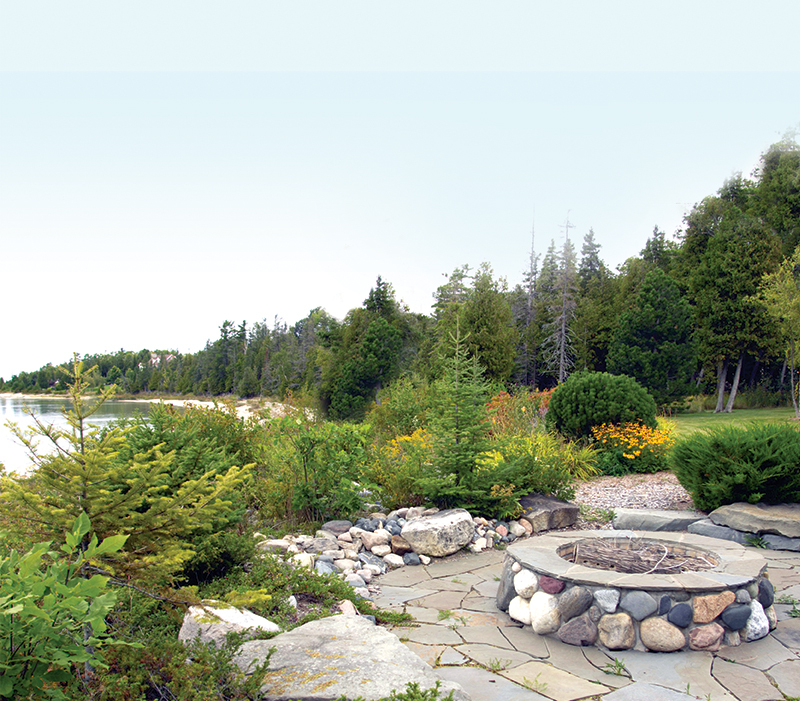 Natural shorelines are a green infrastructure technique using native plants, biodegradable products, and other natural materials to provide a stable shoreline. Natural shorelines provide a better alternative to hardened shorelines like seawalls or bulkheads. They provide numerous benefits including nutrient pollution remediation, habitat for fish, waterfowl, aquatic insects and other shoreline-dependent species, and protection of the shoreline from waves and storms. 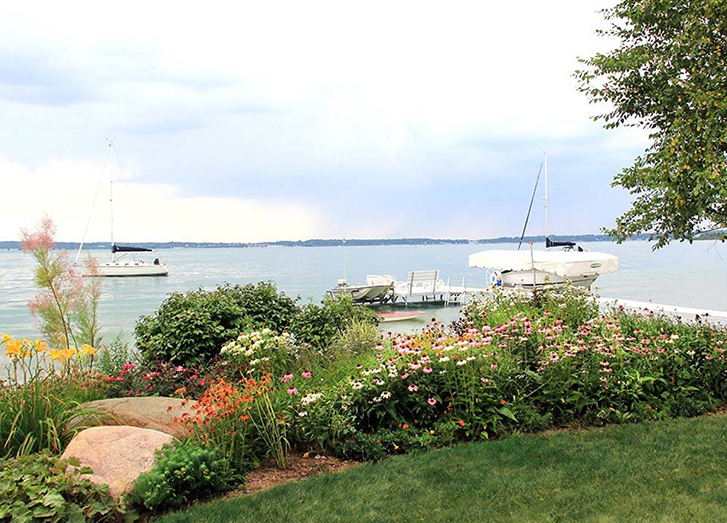 Plants, shrubs, and trees can also provide an attractive privacy screen for property owners while maintaining views of the lake. On shorelines where native vegetation has been removed it is possible to restore the shoreline with a combination of methods known collectively as bioengineering techniques. Bioengineering is usually less expensive than structural methods like concrete seawalls. Some applications can be done by the homeowner while other applications will require a contractor. Natural shorelines can increase resiliency to large storm events and reduce the risk of property flooding. Natural shorelines are also known to store carbon, which keeps carbon out of the atmosphere. Protection and restoration of natural shorelines will result in increased carbon sequestration and storage, potentially mitigating the effects of climate change. Additionally, the preservation of good water quality can increase property value and/or recreational opportunities. Newly planted areas will require some initial maintenance. Once established, there is little to no maintenance required. Bioengineering is usually less expensive than structural methods like concrete seawalls. The estimated cost of installing a natural shoreline, including bioengineering materials, averages from $10-20 per linear foot. The financial cost of hard armoring the shore (using seawalls and bulkheads) can range from $45-200 and up per linear foot. Porous or permeable surfaces allow stormwater to infiltrate into underlying soils, thereby promoting pollutant treatment and groundwater recharge. Depending on design, paving material, soil type, and rainfall, permeable pavements can infiltrate as much as 70% to 80% of annual rainfall. 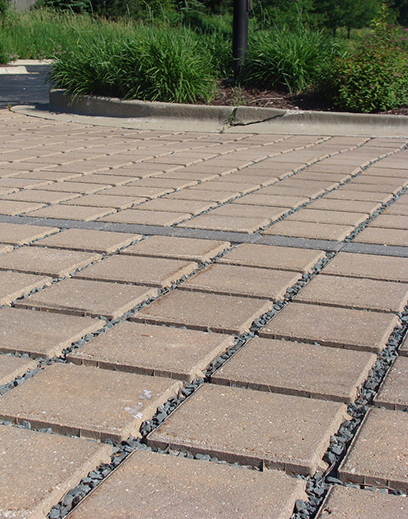 Permeable paving options include block pavers, porous asphalt and concrete, and vegetated grid systems. ​Permeable pavers are comprised of interlocking concrete bricks, separated by joints or gaps, filled with small stones or sand, which are laid over a bed of aggregate stones. 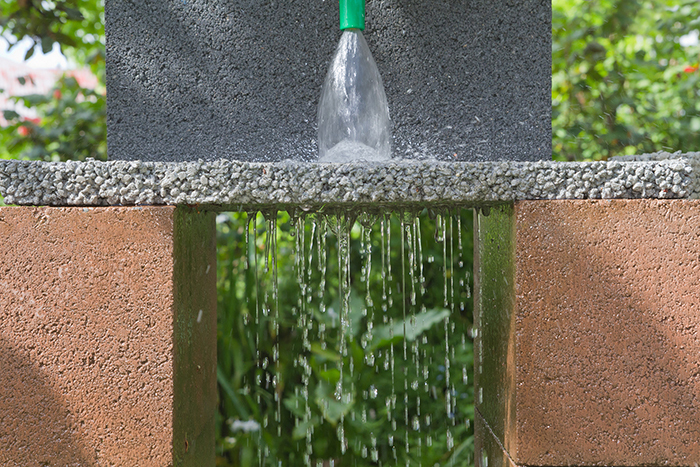 Water is able to infiltrate through the joints in the paver and is stored in void space in the stone bed underneath the paver surface, where it is then filtered back into the soil. Porous asphalt is the same as regular asphalt except it is manufactured with the fine materials omitted, leaving open spaces that allow water to filter through to a “recharge” or drainage bed. 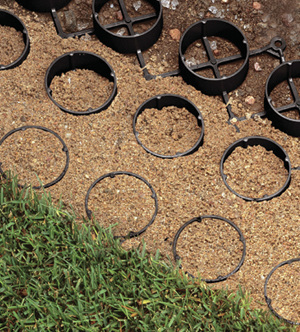 Vegetated grid systems are plastic or concrete grids over a bed of drainage material and soil. The voids are then seeded with low maintenance grass varieties. Permeable pavers and porous asphalt and concrete are generally used in higher traffic parking and roadway applications while vegetated grid systems are more commonly used in auxiliary parking areas and roadways. Porous or permeable pavement surfaces are best suited for parking lots, low traffic residential streets, driveways, and sidewalks. Porous pavement projects need to be designed and constructed by an experienced professional. It is critical that all types of porous pavement projects are maintained according to manufacturer specifications. Initial costs for porous pavements are typically higher than costs for conventional pavements. However, these initial costs are often said to be offset by eliminating the need for other stormwater infrastructure. Keep the area clear of sediment to prevent clogging. Annual sweeping or vacuuming of sediments helps maintain permeability. The gaps between pavers may require occasional weeding and sand or gravel replenishment. Because pervious pavers are easily lifted and reset, they are easy to repair or replace. There are several types of permeable paving options available. Below are the average costs by type, per square foot. 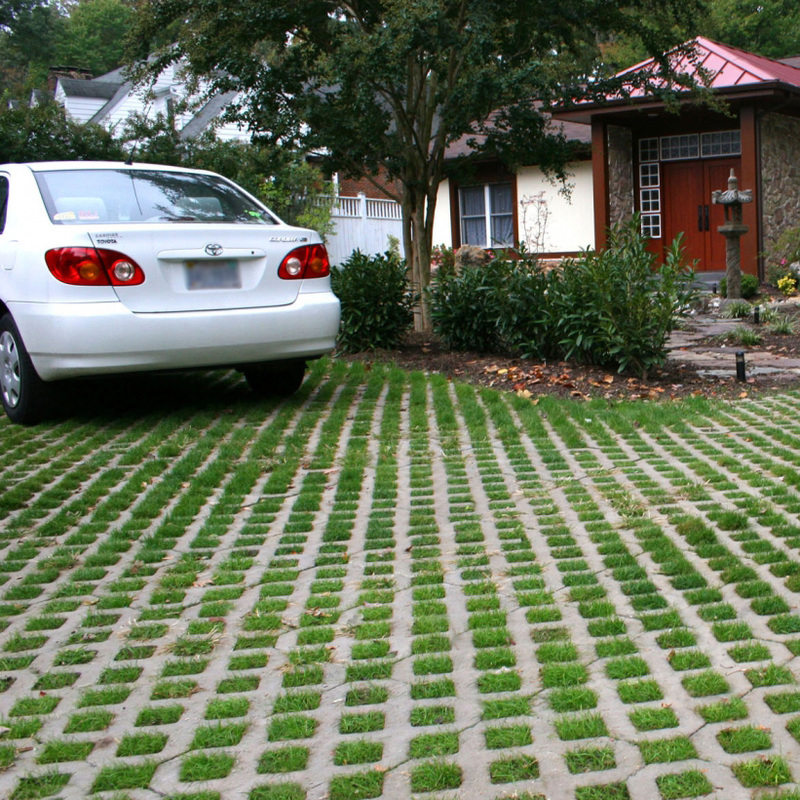 Permeable Pavers: $5.00 - $10.00/sq. ft.
Porous Concrete: $2.00 - $6.50/sq. ft.
Porous Asphalt: $0.50 - $1.00/sq. ft.
Vegetated Grid System: $1.50 - $5.75/sq. ft.
A green roof is a low maintenance vegetated roof system that reduces stormwater runoff by absorbing and retaining the water in the soil medium for plant growth. Green roofs are constructed on top of existing roofs and include four basic components: a waterproofing layer, a drainage layer, a growing medium, and vegetation. In addition to reducing the amount of roof runoff, the plants filter pollutants and carbon dioxide from the air and rain water. They are easy to incorporate into new construction, and can be used on many existing buildings as well. 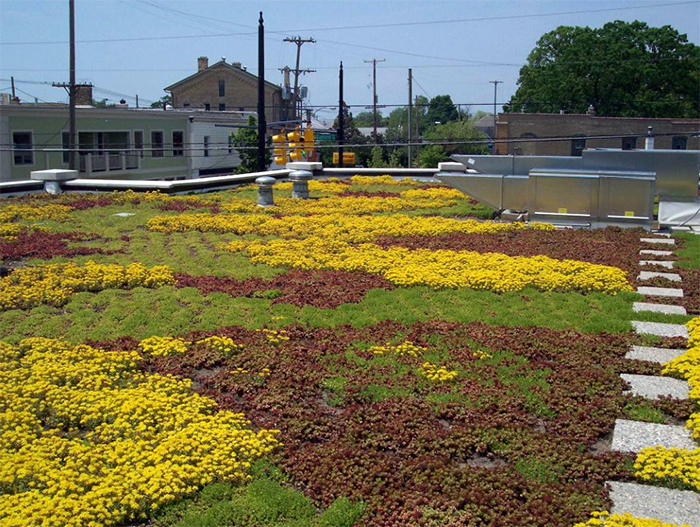 Another added benefit of green roofs include reduced heating and cooling needs and associated costs. Green roofs are likely to last much longer than conventional roofs, since the roofing material itself is shielded from ultraviolet light and thermal stress. Green roofs can also reduce noise pollution and serve as living habitats for birds and other wildlife. The vegetation needs watering during establishment and will require weeding usually once or twice a year. the soil substrate/growth medium and the plant components. However, a properly designed and maintained green roof can save money in the long term from reduced utility costs and roof maintenance. Routine maintenance is required for bioswales. Before a planted swale is densely vegetated, it is extremely vulnerable to erosion and must be protected with straw matting and other erosion control materials. Maintenance of a dense, healthy vegetated cover consists of periodic mowing (keep grass 2-4 inches high), weed control, reseeding of bare areas, and clearing of debris and accumulated sediment. Swale conveyance is cheaper than pipe systems. 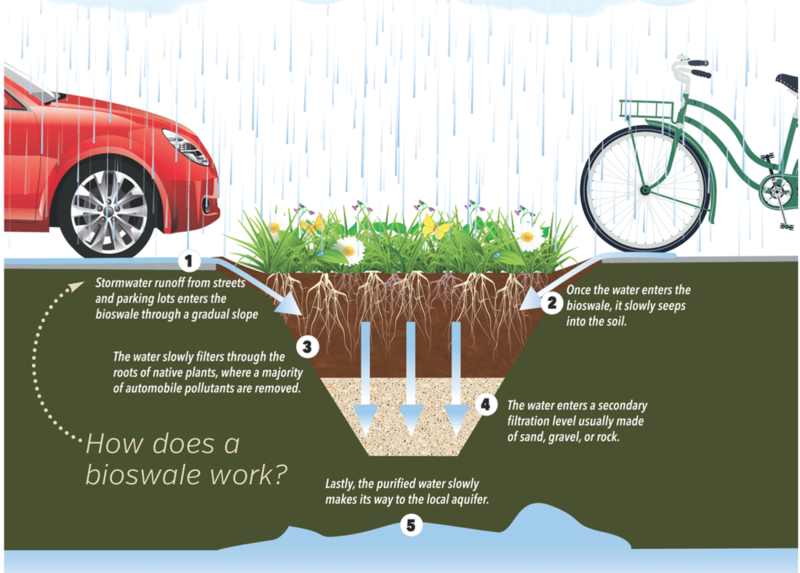 Bioswales are shallow channels designed to slowly convey water to storm sewer inlets or surface waters and filter the ‘first flush’ of runoff. The first flush occurs during the first few moments of a rain event when pollutants are most concentrated. The vegetation in swales help trap pollutants (suspended solids and trace metals), reduce the velocity of stormwater runoff, and encourage infiltration. In some cases, street-side bioswales can replace curb and gutter systems, as well as storm sewers. Filter strips and grassed swales are easily located and constructed. The vegetation is highly effective in preventing erosion and thus controlling sediment in stormwater runoff. Funding for the development of this webpage provided, in part, by the Michigan Coastal Zone Management Program, Office of the Great Lakes, Department of Environmental Quality, under the National Coastal Zone Management Program, through a grant from the National Oceanic and Atmospheric Administration, U.S. Department of Commerce. The statements, findings, conclusions, and recommendations are those of the authors and do not necessarily reflect the views of the Department of Environmental Quality and the National Oceanic and Atmospheric Administration.